Each month we profile a member volunteer who has demonstrated outstanding support for Housing Colorado's mission, either by serving on a committee or contributing their time and energy in other ways. 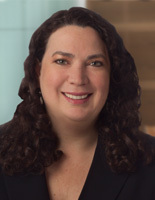 Melinda is a Shareholder at Polsinelli PC, a national, full service law firm with over 800 attorneys in more than 20 locations throughout the country. She represents developers, lenders, providers and investors in affordable housing and healthcare real estate transactions. How did you end up working in affordable housing? I worked on my first LIHTC transaction during law school while I was a summer associate at a law firm. From a professional perspective, I was instantly hooked and went on to take as many tax classes as possible during my last year of law school. From a personal perspective, I have always been very involved in my community and knew instantly that this was the way to make a difference on a daily basis while also satisfying my need to be intellectually challenged. I love working with amazing, smart and dedicated people while being constantly called upon to think outside of the box and find creative solutions to make a project feasible in a way that works for all stakeholders. The ultimate reward is knowing the difference a project has made in so many people’s lives once it is built and that I was part of the hard working team that made it possible. How did you get involved with Housing Colorado? I started by going to the annual Housing Colorado Conference. The Conference was so much fun! I made lasting friendships and professional connections, all the while learning something new about affordable housing and how to better build the communities we live in. How do you currently serve Housing Colorado, and what do you enjoy most about volunteering? I am currently the Co-Chair of the Conference Workshop Committee and a member of the Legislative Committee. Staying up to date, educating others and being a part of shaping Colorado’s communities is something that satisfies this Colorado native like nothing else (except maybe spending time in the beautiful Colorado Mountains with my family). What are some exciting progressions or projects currently going on in your work? My other professional passion besides affordable housing is healthcare and I have always seen a strong synergy between housing and healthcare. This trend is finally starting to take shape and I am working on a number of affordable housing projects in Colorado and nationally that incorporate low-income health and dental clinics, pharmacies and addiction, mental health and behavioral services. What website(s) do you find useful in your work? With all of the exciting legislative activity, The Colorado General Assembly website is my most valuable resource during the Colorado legislative season. From a Federal perspective, I keep up to do date on legislative activity for affordable housing through ACTION. For information on affordable housing in other states, Novogradac is very helpful. And finally, the HUD and CHFA websites help me to stay up to date on specific technical issues. What project, program or undertaking are you most proud of and why? There is no way I could choose just one. Each project I have worked on holds a special place in my heart. Each one has had its own unique challenges along the way but has ultimately gone on to serve so many people by providing much needed housing and services. Who has been an instrumental mentor through your career so far, or who do you look up to? Generally, I look up to all my colleagues who choose affordable housing over more lucrative finance and development careers because they are committed to the outcome of their work. I could easily be accused of bias, but I truly believe that I work with the smartest, most creative and dedicated people who on their worst days run circles around the most sophisticated Wall Street dealmakers.